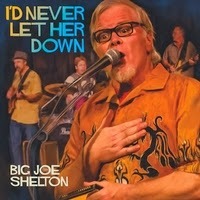 I just received the newest release from Big Joe Shelton and it's quite entertaining. Opening with Frog's Hair, a shuffle tune, Shelton rally's the troops with his ruckus vocals, Ben Ferrell responds with hot riffs on the guitar and David Reese hits the keys. On title track, I'd Never Let Her Down, Bob Damm keeps a Latin rhythm as Shelton tells the tale, Doug Thomas warms up the track with nice sax work and Ferrell steps up with stinging guitar riffs. How Good Love Could Be highlights Shelton's skills on harp with a Butterfield like blues track. Stop The Hating is a reggae style track and Damm is tight with Ed Swan on bass. Laugh Out Loud is a blues ballad with nice melodic guitar riffs from Ferrell and complimentary sax riffs from Thomas. Little Willie has a strong Bo Diddley style track reminiscent of Willie and the Hand Jive or Willie the Wimp. Shelton shows really nice story telling skills on this track and slide work from Ferrell makes this track hot. Catfish Ed is a laid back country style track with a nice intro from Susan Alcorn Lobato on steel. David Reese rools the 88's nicely on this track as well. Pity Party is a solid ballad featuring some of Shelton's best vocal work on the release. Strong Addiction, a Chicago style blues track finds Shelton back on harp and the track is rolling. Another stinging solo from Ferrell on this track is a nice compliment. Riding With The Wind has country styling with a Latin rhythm. Actually pretty cool with guitar effects. I really like Ferrell's work on this track that I can only describe as like early John Mayall in nature. Wrapping the release is Leaving Yo Behind has a feel of Evil (Going On) with a cool bottom and smokey harp from Shelton and easy slide from Farrell. This is a cool release and one that I enjoyed reviewing.